Effective, Monday, August 3, 2015, OSHA issued a new standard for construction work in confined spaces. The new subpart replaces the existing training requirement with a comprehensive program designed to protect employees from the atmospheric and physical hazards associated with working in confined spaces. The new standard reiterates the importance of enforcing required safety procedures by addressing construction-specific hazards. With the new change, OSHA aims to reduce the number of injuries and accidental deaths at hazardous area construction sites. According to OSHA Assistant Secretary of Labor, Dr. David Michaels, the new rule places a stronger emphasis on training, requires continuous worksite evaluations, and raises communication standards throughout the industry. In a constantly changing work environment, it’s important for construction workers to have a proficient understanding of the exposure hazards and the methods used to isolate and control those hazards. The new rule requires employers to provide training, at no cost to the employee, to ensure each employee – new or existing – has the knowledge and skills necessary to safely carry out his/her responsibilities on site. Employers must also administer additional training when there is a change in working conditions, a new hazard is presented, or technology improves. Under the new mandate, worksites must be continuously evaluated to ensure conditions remain safe when the environment changes as work progresses. Working in confined spaces can present many avoidable hazards; if they are recognized during an evaluation and workers have been properly trained on emergency safety procedures. The new standard requires continuous air contaminant and engulfment monitoring, and states that employers must coordinate emergency services before any workers enter a confined space. To further ensure safety measures are carried out, the new rule raises communication standards throughout the construction industry. It requires controlling contractors to coordinate entry operations among sub-contractors who have employees working in a confined space. 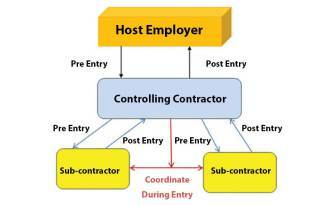 The controlling contractor must communicate with the host employer before and after entry. Sub-contractors must also coordinate with one another and the controlling contractor during entry into a confined space. This open and ongoing communication should help keep workers safe, with controlling contractors outside the confined space alerted and available to send rescue services in case of emergency.